Bottomline: The lightweight headset with flexible collar style can fit easily in your neck and offers decent sound. 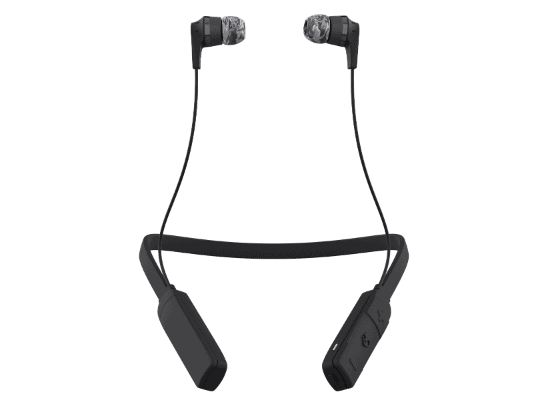 We have tested numerous products from Skullcandy and this time we have got Ink’d wireless headset. It looks a bit different than other wireless products when we first took it out of the box. The headset comes with low-profile and it can easily fit around-the-neck collar. When I picked up the device, it feels quite lightweight. It’s designed in a way to be wrapped around the neck easily. It fits comfortably without teasing the neck. The band is made with flexible material which makes it easy to wear. It also comprises control buttons, enabling the user to operate the device comfortably. The earbuds are attached with a thin wire and the plastic buds are covered with silicon ear tips. The buds sit securely in-ear and offer tight seal against noise. Though we didn’t think of such a good performance from this tiny headphones, however surprisingly it did well. We enjoyed various music tracks on it. It delivered balanced sound. Though the bass was there but not enough, so you can’t enjoy hip hop and club music etc. Talking about treble, it is a great headphone. With the clear sound quality over the call and pretty balanced sound, it is one of the good devices. The wireless headset can easily be setup with any smartphone. And you can enjoy uninterrupted music for more than 7 hours in one full charge.